Training Feedback Forms : Nex-G Exuberant Solutions Pvt. Ltd.
Nex-G Exuberant Solutions Pvt. Ltd. is an ISO 9001:2008 certified company. We have well-defined systems and processes in the form of a QMS (Quality Management System) to take care of presales, project management, engineering, project support, process management, customer relationship management, information management and internal functions(Admin, Finance, HR, IT, Quality, Sales & Mktg). 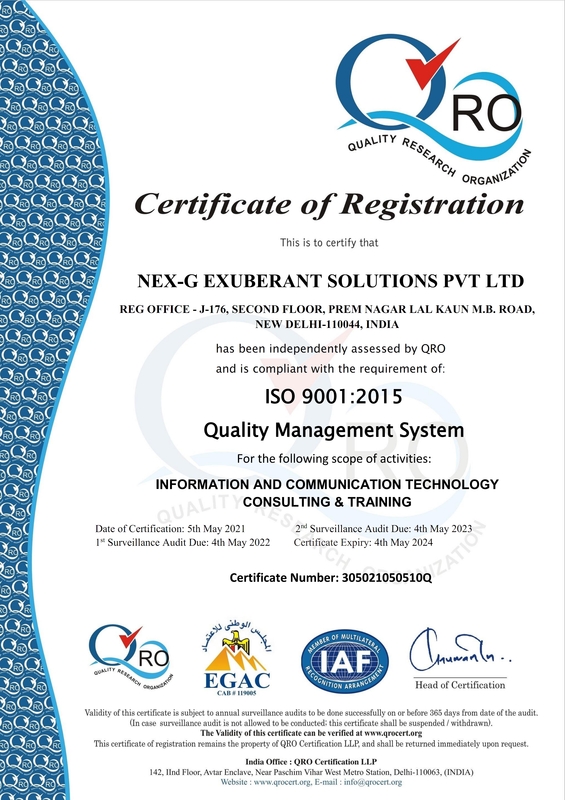 Nex-G's processes, services and organizational structure is geared towards ensuring that every delivery to the customer passes though our stringent quality measures. We have created a work culture that believes in stretching innovative thinking to its limits and exhibiting a no-compromise attitude towards quality. We provide best-in-class services to customers by continually improving the effectivenss of our quality management systems and enhance customer satisfaction.